Our group’s interests revolve around fishing, kayaking, keeping fit and being enthusiastic about life. Our realm is the sea around Noosa’s coastline, the Noosa River system, and local freshwater lakes. Kayak fishing is fun, great exercise and a means of acquiring new friends and useful skills. Please use the links panel below right to contact us or to find out more about our activities. jaro, sunshiner, whalebait, eyetag, maverick, happy Noosa Yakkers, May 2010. 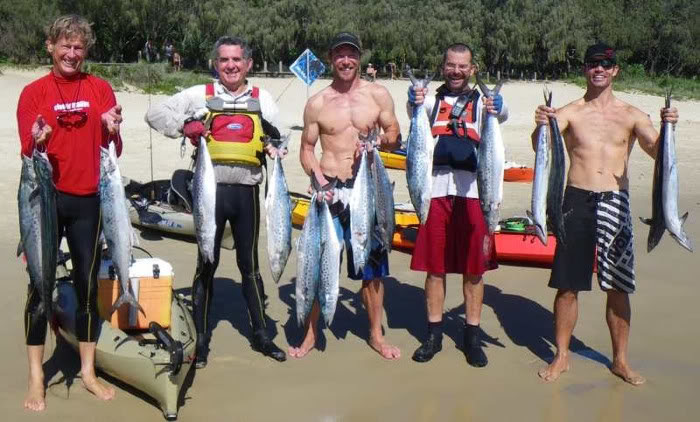 Back in 2006 a few Noosa locals started to fish offshore from their kayaks regularly, and started to get results. But mainly they had fun, fishing together, enjoying the camaraderie, adventure and challenge. Within a year the circle of kayak fishers had expanded and the founders decided to use emerging technology in a bid to assist communication within the group. Right from the start we decided to keep it simple: no formalities, no property, no money and no idiots. Noosa Yakkers is the result. All members are keen kayak fishers and many of them live in the Noosa area, but quite a few live and fish much further away. Some fish regularly but others only three or four times a year. Sometimes we have ten or a dozen members fishing together, but often it's only one or two. It's a community that gets together for a beer once a month but much more often through email, Facebook, this blog and on the water. We hope you enjoy the content of this blog and our public Facebook Page and if you're so inclined, no matter where you live, feel free to approach us to join up but be warned, we're kayak fishers. Membership is free. Noosa Yakkers has both a public Facebook page and a closed Facebook Group. Public Page. The public Facebook Page is an introduction to Noosa Yakkers and is designed to allow visitors to view some of our best kayak fishing photos and videos. It also allows visitors to easily access our membership process and to send Facebook messages to us and even to post items (subject to moderation). Click here to visit our public Page. Facebook Group. This is action central for Noosa Yakkers, where members share kayak fishing information including fishing trip details. It's closed, which means it's fully accessible only to Noosa Yakkers' members (people who have been accepted into Noosa Yakkers using our normal membership processes; click or tap here to apply to join). The Facebook Group is accessed here. Even among the regular membership not everyone is a Facebook user, which is also essential to access our Facebook Group page. However we're encouraging all to take this small step, as we have found that our Facebook Group facility provides unmatched internal communication benefits. To demonstrate some of the benefits we've created this small movie. If you're not familiar with Facebook you may find it useful in explaining some of the features available in a Group. Arguably, the unrestricted parking, unrestricted launching, kayak washing facilities and general amenities (including access to friendly fish-holders) at Middle Groyne are some of the greatest assets accessible to Noosa Yakkers. While there has been no lasting restriction to our access to Middle Groyne facilities in the decade or so we've been using them, we would be foolish to disregard the possibility that things could change for the worse. We would also be foolish not to do everything we can to make sure that Noosa Council, the beach authorities and the Noosa community perceive our little group of kayak fishers as being not only an interesting facet of the local beach/ocean culture but also exemplary users of the facilities the authorities freely provide at significant cost to their tight budgets. 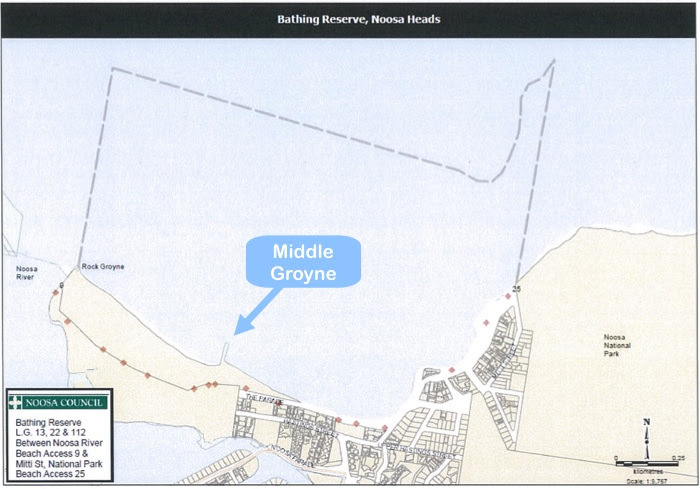 All Noosa Yakkers need to understand that the Main Beach area has special status as a Bathing Reserve and is controlled by Noosa Council, and that the Council's authorised representative in the Bathing Reserve is the Patrol Captain of the Noosa Council-funded lifesaving service. How can we maintain and even improve our present high status as valued members of, or visitors to, the local community? In addition to becoming a tourist attraction (which some might say we already are), there are a few small things we can do at no cost to ourselves. Generally observing these relatively minor and everyday courtesies is a no-brainer for Noosa Yakkers. Let's go out of our way to miss them on the water, and to be friendly with them on the water and on the beach. Be aware that any object or surface (including in your kayak structure) which may cause cuts may not be permitted in the Middle Groyne area, so make sure your gear is stowed. This applies particularly when returning through the surf after a fishing trip. Kayaks are specifically banned from use within the "swim-between" flags on a bathing beach. The lifesaving professionals and SLSC community have helped us before and are presently among our greatest supporters. Treating them courteously and respectfully will pay dividends and make you feel good too. Also they let us secure our wheels under their stairs and have been known to hold and return mislaid yakker equipment! Don't use tap water indiscriminately, although offering to gently hose down sand-covered children is usually acceptable to harassed parents. Watch out for accidental overspray (humorously deliberate is OK, but not on bridal parties). There's no law that says we can't clean fish on the beach and nor should there be. But… our landing point is within a designated Bathing Reserve and we share it with many other people. Dumping fish offal in the water or in the rocks of the groyne should be avoided as many beachgoers believe (rightly or wrongly) that such behaviour may attract sharks. People also quite reasonably object to fish guts washing around in the water or onto the beach. Consider using dedicated fish cleaning facilities at Munna Point or elsewhere. If you decide to clean your fish at Middle Groyne, you should bag the offal (carry a few plastic bags in your yak) and then tie the bag and dump it in the daily-serviced wheelie bin at the access road beach entrance. Take extra care not to ding your yak by impact on cars, especially other people's. Be friendly and courteous to parking inspectors, council employees (especially the diligent and patient cleaning guys whom we encounter pre-dawn) and other parking area users. Watch out for little kids, especially when reversing. See some litter, on the beach or in the ocean? Pick it up and bin it. With your help the Middle Groyne kayak launching experience in 2065 will be just as pleasant as today. This page, with its embedded videos, aims to help you judge whether your proposed offshore kayak fishing trip is safe as far as weather is concerned at least. 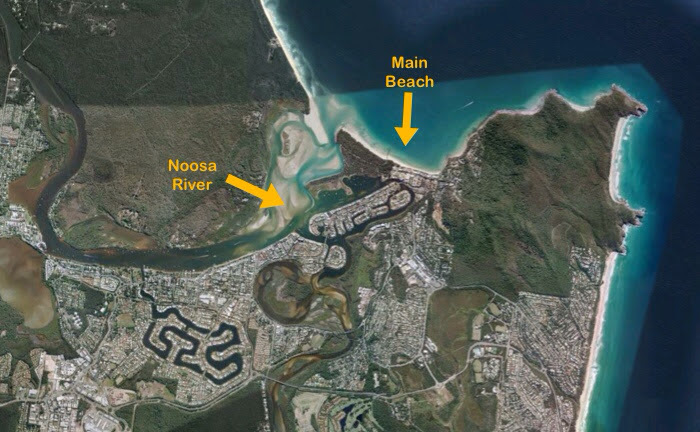 This video (4:10) uses Google maps with spoken commentary to detail Noosa's main topographic features, launch points and fishing locations, and the weather impacts. The third (4:58) uses spoken commentary and seabreeze.com.au to explain one way of making accurate judgements as to the swell height and direction and the wind strength and direction in the Noosa area. Both of these factors are prominent in safe offshore kayak fishing. Note that the indicated reef locations on the map are approximate. Use of the provided coordinates will guide you to the locations. 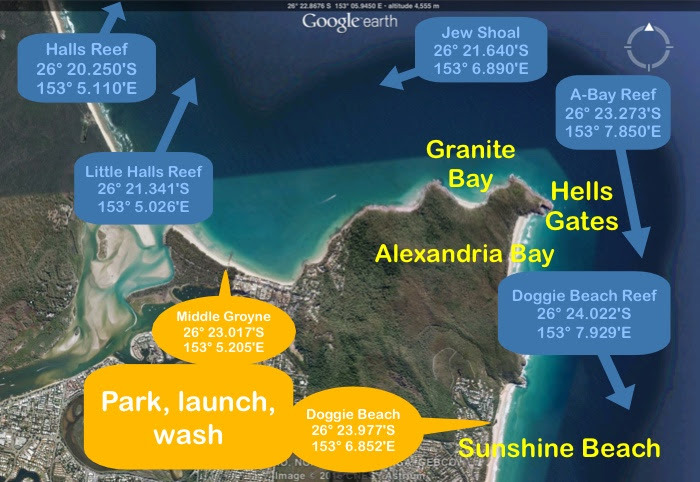 The best launch location is Middle Groyne, with Doggie Beach being viable only rarely, due to sea and swell conditions. Please read the "Middle Groyne etiquette" page (linked from the sidebar) before launching at Middle Groyne for the first time. If your GPS is connected to your browser viewing device you may find it easier to establish the necessary waypoints by copying and pasting from the following. 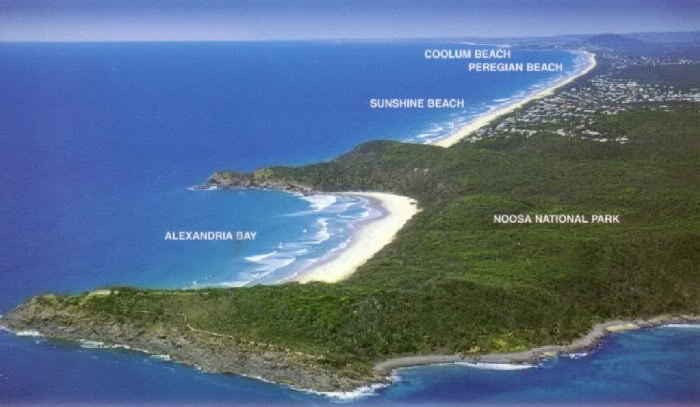 Noosa Heads overview. For detailed kayak fishing locations see here. For info about authorisation of this post, see the last paragraph. The book and its free sample are usable on iPhones (iOS 8.4 or later) Macs (Mavericks OS or later) and iPad (iOS 5 or later). This is because the iBooks App is the only platform I found which offered a relatively straightforward publishing path for digital books which contain movies and interactive images, which this book does, having over 200 quality still images and 12 movies (119 landscape pages, 29,000 words). There are no signs yet that this new book format will be available on any other platforms so I had to make a choice: an excellent book that worked really well on one very popular platform, or a huge variety of different formats none of which held a candle to this multi touch book and which were still not usable on multi platforms. A link to the book's iBook Store page is above. Note that a free sample (with movie and interactive images) is available. Once downloaded, either or both sample (18mb) and book (145mb) are stored in iBooks on your device. If you buy the book, and I update it, you are eligible for free updates. Likewise, if you update your device, you retain the right to transfer the book to the new device at no cost. No Mac, iPad or iPhone, but would like to see the sample? Let me know and I'll send you a ten page PDF free sample (only 2.5mb) which is viewable on any computer, but lacks the movies and interactive image features of the iPad version. The inclusion of this page in the Noosa Yakkers blog has been authorised by the committee. In late November 2012, Kev Long successfully published a digital book (Kayak Fishing Manual) and made it available for worldwide distribution on Apple's iBookstores. The book contains many images, video included, of Noosa Yakkers members and their activities and also publicises and links to Noosa Yakkers blog. Accordingly, the committee considered inclusion of this page in our blog to be reasonable, even though revenue from sales of the book belong to Kev's publishing entity.